Let’s face it: a lot of people probably haven’t heard much about Yager Development’s upcoming title, Dreadnought. We’ve only seen a limited amount of information regarding game features, and nothing about the team’s business model. So when we saw them at the Greybox booth at PAX South, we knew we had to get our hands on the game to see what it was all about. Considering the sheer length of the lines to play the demo, it became obvious a lot of people were also very interested in the project. After playing a match, we had a chance to speak with Peter Holzapfel, the game director, to pick his brain on this truly epic space arena experience. A little background on Dreadnought might prove useful. 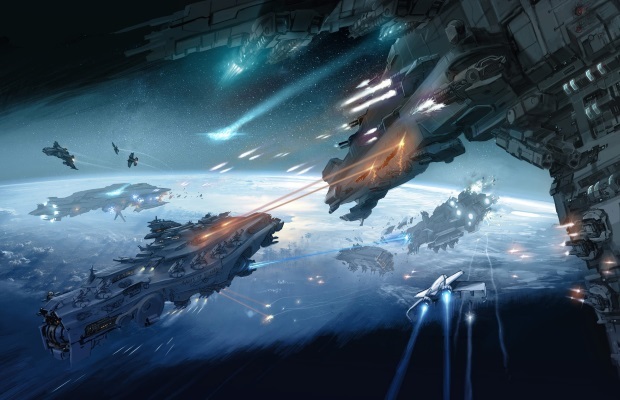 Dreadnought is a team-based space arena shooter. The twist, however, is the scale of the ships involved — they’re absolutely massive. 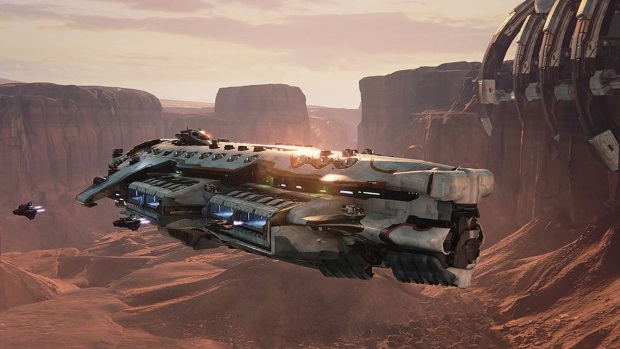 Even the smallest of ships is larger than most games offer. The net effect is matches are much slower paced, in every conceivably positive fashion. Accuracy is very important, as is knowing how to utilize your ship’s unique movement ability. Teamwork, too, is much more encouraged with this style of play, as you cannot get away with doing your own thing (at least for very long). The pre-alpha version we played showed us five different ships: the dreadnought, the destroyer, the corvette, the artillery cruiser, and the tactical cruiser. 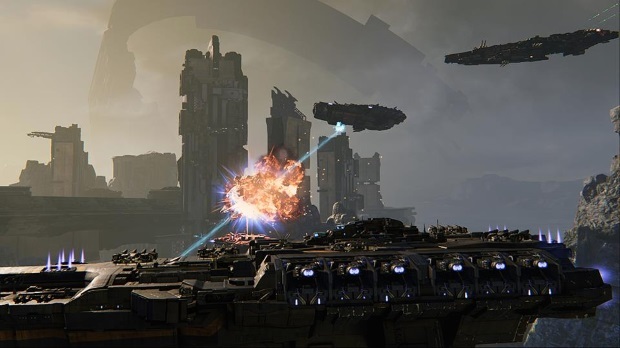 The dreadnought is the tank of the game, however, it’s far more than just that. You see, it’s movement skill allows it to warp to allies and foes alike, to protect or to devastate. 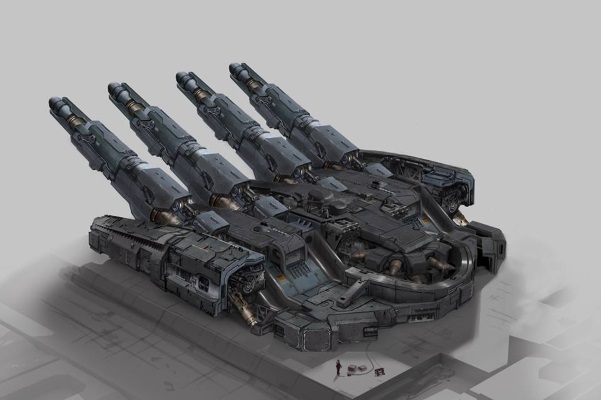 The destroyer is a mid-range fighter, except its unique skill turns it into a battering ram of ship destruction. The corvette functions as the scout, getting enemy information for allies, as well as harassing choice targets with its ability to cloak. The artillery cruiser is the sniper of the bunch, preferring to stay at long range and deliver massive damage with its tesla cannon, and can really ramp up the pressure by entering a rapid fire mode. The tactical cruiser can be likened to a healer of sorts, but it’s not helpless, as the beams it uses to repair can also be turned on the enemies to destroy. Energy management is also incredibly important in Dreadnought, as you can use it to power up your shields, empower your weapons, or give yourself a much needed boost in thrust to enter (or escape) the fray. The modes can be changed on the fly by utilizing the middle mouse button, and it’s very important to do so, because a ship without energy is a destroyed ship in a matter of seconds. One nice thing we found was the ability to spawn as a different ship, depending on what the match required at any given time. I started out as a destroyer, gleefully attempting to smash into any ship I could with my plasma ram. However, halfway through, it became obvious we needed more ranged support. Not a problem, switching to the artillery cruiser provided that much needed boost. Giving the players the option to adapt to the other team is a very nice touch that’s sadly falling by the wayside in a lot of competitive games. After the match (the MMOHuts/OnRPG crew was not successful this day, sadly! ), we spent some time talking to Peter about the direction the game was taking. They absolutely want the multiplayer aspect to be free-to-play, while the single player content can be released in purchasable episodes. The ship’s weapons will eventually be able to be customized to provide a loadout that any player can be comfortable with. None of us could stop gushing over how responsive the controls were and how intuitive everything felt. Peter explained how deliberate that was: they wanted to make a game that captured a large scale feel, without being needlessly complex and obtuse. We asked if damage was a simple calculation or whether location of hits mattered. In its current state, all damage is created equal, but area-specific damage is something they wanted to implement, assuming it does not take away from the core of the gameplay. 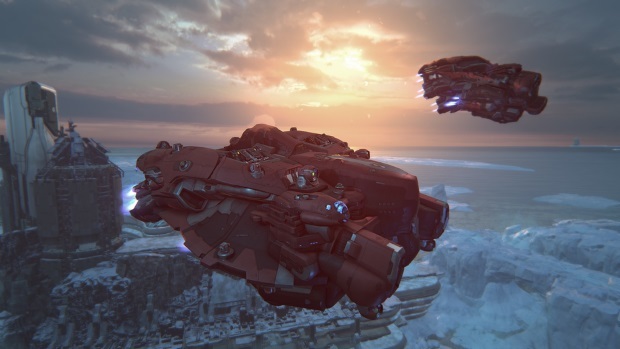 Overall, Dreadnought was an adventure we’re all glad we experienced.